Agent Turnover is on the Rise! Centers that take an “eyes open” approach to analyzing turnover have seen agent satisfaction improve by over 500%. Employee turnover is the bane and a pain for many contact center managers. It is expensive, disruptive and it weighs on employee morale. It contributes to an unpleasant work environment and increases costs in ways that are frequently unknown and unexplored. 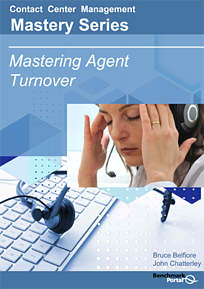 Download our 20 page ebook today to improve your agent turnover.